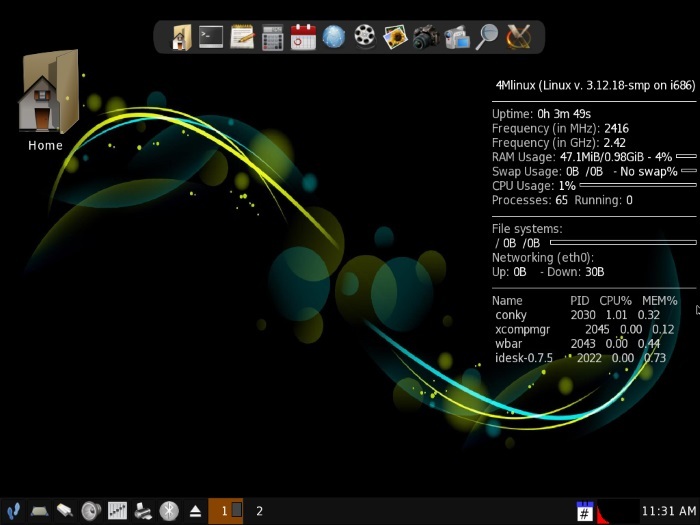 4MLinux is a small Linux distribution that caters to the four M’s, which in this case are Maintenance (system rescue Live CD), Multimedia, Miniserver and Mystery (i.e. games). Each of the M’s has its own special version of 4MLinux, so there is “4MLinux Server Edition,” “4MLinux Rescue Edition,” and so on. Or you can download the All-in-one version which combines all four. The 4MLinux review here will discuss the all-in-one version. 4MLinux doesn’t require very many system resources. The default desktop environment takes less than 64MB of RAM and less then 1GB of disk space when fully installed. To achieve such a small memory foot print, 4MLinux uses JVM (Joe’s Window Manager) rather than the more memory hungry desktop environments like GNOME or KDE. Download the “4MLinux Allinone Edition” .iso file from the 4MLinux download page. Burn it onto a disc and boot your PC from the disc. 4MLinux will boot as a Live CD. To install 4MLinux to a hard disk, use the supplied Installer. Click on the menu button (the pair of footprints) and then navigate to 4MLinux -> Installer. The installer won’t create any partitions for you; it expects you just to tell it which partition to use. On my test system, the primary hard disk had no existing partitions. Before I ran the installer, I used the included copy of GNU Parted to create an ext4 partition and a swap partition. Alternatively, you could use “fdisk” from within a terminal window. For more information on using fdisk, see the Managing Hard Disk Partitions Using fdisk tutorial. Where “/dev/sda1” is the target partition. Before the installation starts, the Installer will list a summary of the changes which will occur (e.g. that the target partition will be re-formatted and so on). Confirm the changes list to start the installation. The install is all text-based and should happen fairly fast. Close the Installer window and then reboot (without the disc in the optical drive). The first time you boot, 4MLinux will continue to install some additional files and it will then ask you to set the root password. The pre-installed software on 4MLinux is divided into one of the different M categories (Maintenance, Multimedia, Miniserver and Mystery). Some of the software is native, like the default web browser QupZilla, but some of the software is provided via Wine. 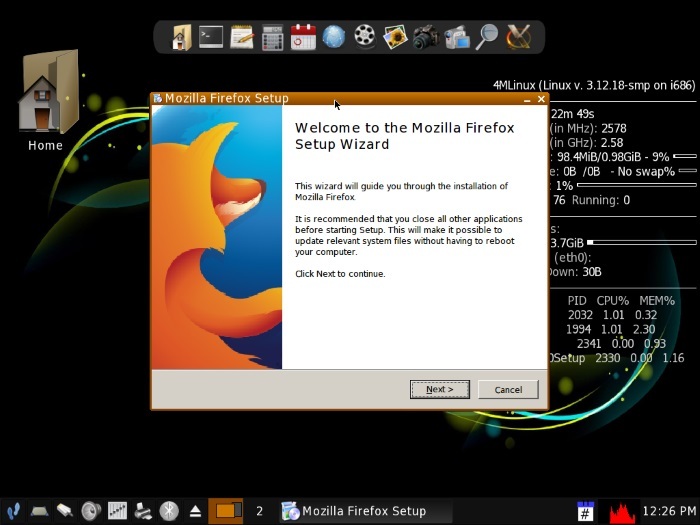 So if you want to run Firefox, then 4MLinux will download and install the Windows version. The same is true of programs like PuTTY (the excellent SSH client), 7-Zip, Audacity and InfraRecorder. If there are any missing prerequisites, like the Microsoft .NET runtime, the installer will automatically download them. 4MLinux also offers a number of “Extensions”, which basically means downloads from the 4MLinux repository. The current set of extensions is quite limited with LibreOffice, VirtualBox, Development and the Java Runtime Environment (JRE). But since this is a mini-distro, the inclusion of these packages is actually more than one might expect and a very useful feature. Overall 4MLinux is fast and functional. The different “M” editions will certainly find their niche, and the All-in-one edition is quite useful, especially for use as a portable distro on a USB flash drive or to revive an aging PC. If you need any help with 4MLinux, the project’s lead developer has a 4MLinux-related blog. Also you can ask any 4MLinux related questions in the comments section below and we will see if we can help. So basically 4M runs Windows apps in Wine rather than native Linux apps. So this could be the replacement for Windows 98 on that old non-starting box. That’s a shame if it can’t use Synaptic Package Manager to buiild a real Linux OS. Nice review; from a neutral perspective. It’s also on the Exton Multiboot CD/DVD, if one can get it to boot.